Orangutans are critically endangered in the wild because of rapid deforestation and the expansion of palm oil plantations into their forest home. They need our protection. It costs around US $3,000 a year to rescue, rehabilitate and release each orangutan. YOU can make a difference! Your donation will ensure that we can continue this important work. With your help, we can give orangutans a future. If your company gives matching donations, please contact us to learn how to match your contribution! Make a donation via PayPal using this button. Please be sure to LIKE us on Facebook and share us with all your friends! See all our social media pages here. Note: The receipt email from Stripe is sometimes delayed, so please be patient. If multiple transactions accidentally go through we will process a full refund for any extra donations. Apologies in advance for any hassle this may cause. 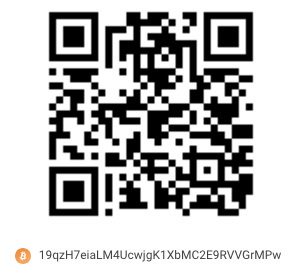 Please contact us to learn more about making a bitcoin donation. Let us know if you send us bitcoin so we can keep an eye out for them! Learn more about this safe, secure way to donate online-- and make a donation today! 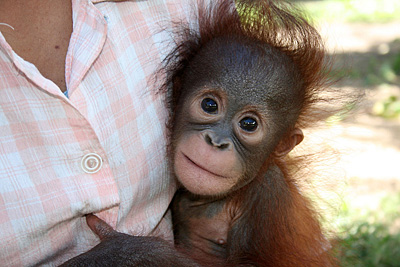 If you're selling something on eBay you can easily make a contribution to Orangutan Outreach. Or if you're buying something you can select Orangutan Outreach at the end of your transaction to make a contribution! Learn more. Help support Orangutan Outreach, and save while you shop! Check out our Shopfunding campaign, where you can find the best deals from thousands of retailers online. There are coupons available for just about everything you're going to buy anyway! For example, you can find coupons for all of your favorite pet foods, products and supplies at Chewy.com, Natural Wonder Pets and Petco. You can help support and raise awareness for Orangutan Outreach, while you save. Check out Goodshop, today. If you are shipping via UPS or FedEx, please contact us for an alternate address as they won't deliver to a P.O. Box. If you wish to make a direct bank transfer, please contact us and we will provide the information. If you wish to send us stocks or securities, please contact us in order to arrange the transaction. We now have a special account to handle financial transactions. You can't take it with you... Making a bequest to Orangutan Outreach is a simple way to leave a lasting legacy. You can make a gift of cash or securities in your Will or Living Trust, and this type of charitable bequest is fully deductible for estate tax purposes. You may make a gift of a fixed dollar amount or percentage of your estate or designate us as a residuary beneficiary of your estate. Learn more about leaving a legacy for the orangutans here. As a policy Orangutan Outreach does not share, sell, publish, post or otherwise distribute any information on our supporters. Contact us if you would like us to email you a tax receipt.